The perfect, simple, very adult and absolutely gorgeous dessert for your next dinner party, or for your wedding supper. Your guests will never know how simple this is! Add sparkling wine to a mixing bowl. Pour ½ cup of the Hibiscus syrup (no flower buds) into the wine. Pour into the wine through a sieve & mix through. 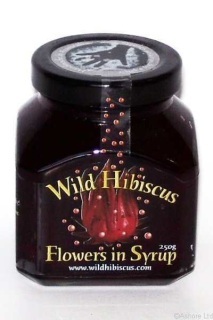 Place a Wild Hibiscus Flower into 6-7 champagne flutes or fancy glasses & 2/3 fill with the jelly mix. Top with a whipped cream swirl, maraschino cherry (preferably with stems) & curled dark chocolate. Tip: Curl dark chocolate by warming slightly & using a potato peeler, Enjoy! Tip: Canned whipped cream will do fine such as dairy whip etc. ​A 250g jar containing 11 Queensland wild hibiscus flowers in Syrup, with a scattering of Hershey's Kisses, presented in a black gift box with ribbon. $29.00 (NZD) price includes fast delivery within New Zealand. Secure Visa & MasterCard checkout plus Apple Pay & Android Pay options (where applicable). A 250g jar containing 11 Australian wild hibiscus flowers in Syrup. $19.95 (NZD) price includes fast delivery within New Zealand. 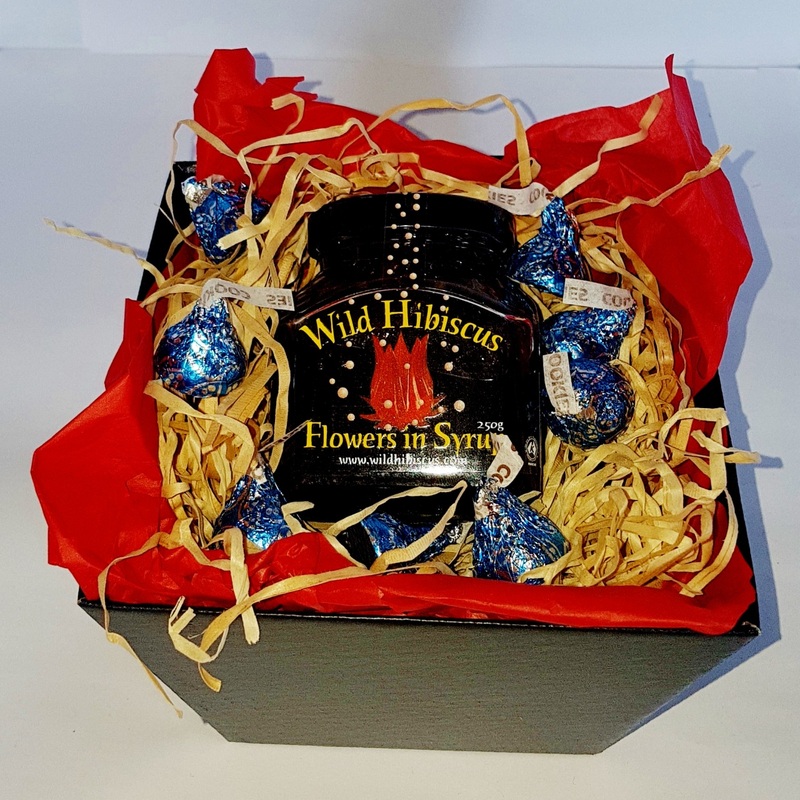 1.1 kg Catering jar containing 50 Queensland wild hibiscus flowers in Syrup. $83 (NZD) price includes fast delivery within New Zealand. 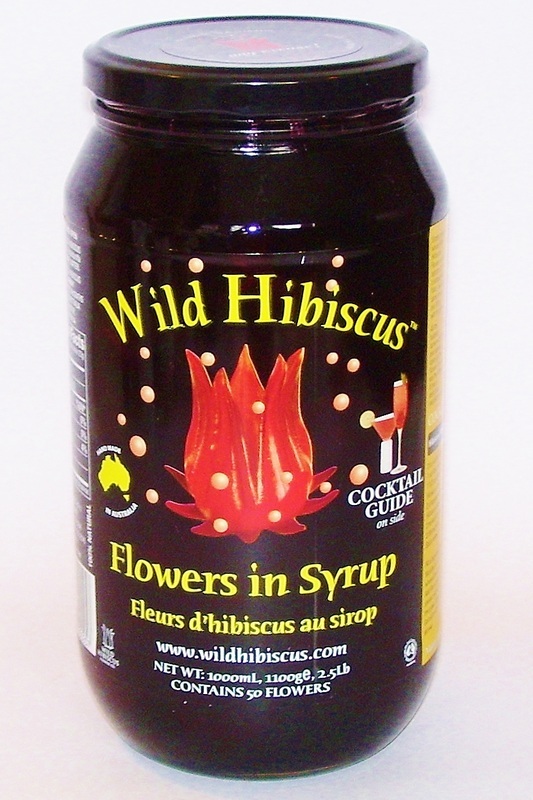 Ingredients: Australian Wild Hibiscus flowers (38%) (hibiscus sabdariffa), cane sugar, spring water.